Movable computer table with vertically adjustable monitor and keyboard shelf. Bottom shelf can be used as additional storage area. 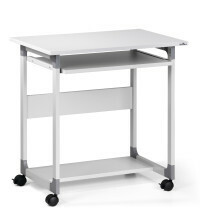 Mobile computer table with four shelves specifically designed for busy working areas where quick access to computer equipment is essential. Mobile PC workstation with retractable keyboard shelf, with working surface for keyboard and mouse. Lower shelf for CPU, printers or paper. 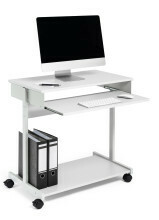 Portable computer trolley with two shelves and a retractable keyboard shelf that is also height adjustable.